It is well-known that Brahms felt intimidated by the example of Beethoven and delayed writing a symphony or a string quartet until he had reached the age of 40, in the case of quartets, and even later for his First Symphony. This did not preclude his writing large-scale orchestral and chamber works in his younger days, among which are his two string sextets. The Allegro of the First Sextet shows that at the age of 27 Brahms was already a master of thematic development. It also demonstrates his life-long interest in folk styles. The Andante, by contrast, has a young man’s seriousness, progressing to a beautiful coda. The Scherzo echoes the Allegro’s folkish elements but also has the drive expected in a scherzo movement. The last movement’s tempo designation includes “Grazioso” and this is indeed the overriding sense of this section. In fact, one could go further and call it “generous of spirit”. With its lovely cello lines and gradual acceleration it demonstrates that even at this point in his life Brahms could produce large-scale works that were both emotionally and structurally impressive. Four years after writing the First Sextet Brahms was recovering from a broken engagement - he had broken it off - with a young woman named Agathe von Siebold. The first movement contains a thematic reference to Agathe’s name and the movement itself is appropriately sombre, though the second theme provides contrast. Structurally, it is a big advance over the corresponding movement of the First Sextet. The Scherzo follows and is more complex than its counterpart in the First Sextet as well as more emotionally diverse. The Adagio is reminiscent in mood, if not thematically, of the first movement, with a plaintive element added. This is countered by an agitated middle section. The finale is a little surprising - a Mendelssohnian first theme strongly developed with contrasting slower interludes. In all, this work demonstrates that by this time Brahms was fully-fledged, if young, although it would still be several years before he attempted the quartet form. The Lindsays — or the Lindsay Quartet as they originally were — were prominent throughout their forty-year career (1965-2005) and were known in both classical and more adventurous repertoire. This disc, originally on ASV, was one of their last. The Lindsays are in fine form here, ably assisted by frequent guest violist Louise Williams and cellist Paul Watkins, a now much more familiar name. The recording quality is very intimate and this adds to the lyrical nature of the interpretations. 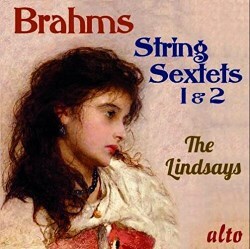 Obviously, there are many other recordings of the sextets and so this disc will appeal those who like the lyrical side of Brahms and to those who are fans of the Lindsays.